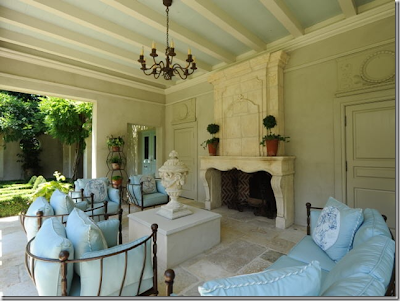 Things That Inspire, I came across this photo of a loggia from a home currently on the market in Atlanta. It took my breath away. At first glance, what caught my eye was the luscious blue color of the outdoor cushions. Upon closer inspection though, I noticed the most amazing detail! The same blue color, but in the most unexpected of places. There was one door, way off to the left, just outside an opening leading off the loggia, painted the same amazing azure blue color! And if that weren't enough, up above on the ceiling, between the beams, was a soft and faded version of the same gorgeous blue...bringing the sky inside! It's this attention to detail that truly makes a space unforgettable! That is amazing. Love the sky blue ceiling! What a gorgeous..gorgeous space Therese. I'm glad you pointed out the ceiling. That among all the other pops of blue do make this room so spectacular. Another testament as to why I want to visit Atlanta. I can't thank you enough Theresa for all your REALLY kind, and thoughtful comments recently. No one ever has to leave comments, let alone such encouraging ones such as yours. I truly appreciate it. I Adore this room and the details~~ especially the color!! you are absolutely right about the details...good eye Terri! when you see outdoor chairs like those, be sure to let me know, remember I'm in the market for deck chairs under my humongous backyard tree. talk about a perfect outdoor entertaining area - i love this! have a great weekend! Wow - I did not notice the ceiling or the door - thank you for opening up my eyes to this! It makes a beautiful space even more beautiful when noticing these incredible details. Thank you so much for the mention! Have a wonderful weekend. Beautiful. An afternoon there would be so nice. I am a passionate treasure huntress addicted to "the thrill of the hunt." I pride myself on finding unique items and have spent a lifetime collecting unusual and interesting "treasures" which I have used in decorating our home. I shop with an eye for design and look for pieces that I like to call the "jewelry" of the room. Those pieces that have been around accumulating energy thereby bringing life into a space by telling its story or evoking a memory. The allure is found in the details of its journey... condition, provenance and patina. Our collected "treasures" tell the story of who we are. Billy Baldwin said it best, "Decorating is never successful unless it is personal." My treasures are available for purchase in my Etsy Shop and on my companion blog, Shop La Dolfina. The links can be accessed from my sidebar. "THE HOME SHOULD BE THE TREASURE CHEST OF LIVING."